Ctenophores are one of the most beautiful, frail creatures to be found anywhere in the ocean. 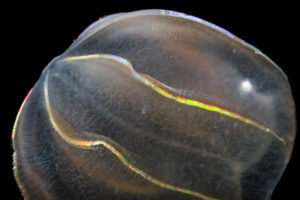 Some are shaped like little glass balls, others like tulips, almost perfectly clear except for their ciliated comb plates that look like zippers. Sea walnut jellyfish (Mnemiopsis macrydi) at Gulf Specimen Marine Lab and Aquarium. tocompare to the living animal. The beautiful shimmering comb plates beat constantly and rhythmically, refracting the sunlight into iridescence. At night they glow with a marvelous, fiery greenish bioluminescence. 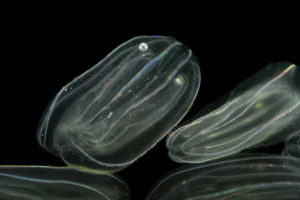 Ctenophores have high powers of regeneration. Size 2-6 cm. The sea walnut. They are brilliantly luminescent. Available sporadically from October through April. Size: 4-8 cm.